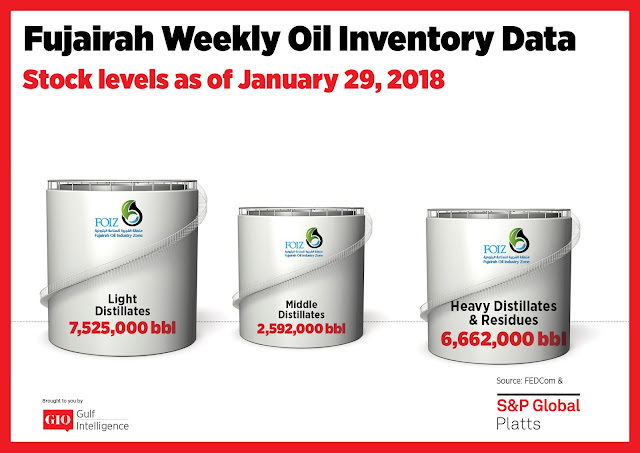 Total oil product stocks at the UAE port of Fujairah stood at 16.779 million barrels as of January 29, up 3.2% on the week, with a divergent trend emerging between light product stocks and record lows for heavies, according to latest data from the Fujairah Energy Data Committee, or FEDCom. Stocks of light distillates rose by 4.5% week on week to 7.525 million barrels. They remained at an eight-month high, reaching the second highest total on record, and are currently 50% or 2.5 million barrels higher year on year, S&P Global Platts Analytics said in a report. The regional gasoline market has seen heavy supply due to high refinery runs and somewhat weaker demand, the report said. A number of Asian gasoline cargoes were heard to have been shipped to the Middle East in recent weeks, despite ample supply in the region. The front-month time spread for Arab Gulf RON 95 gasoline has remained in contango for the past five weeks. Stocks of middle distillates rose by 36.7% or 696,000 barrels to 2.592 million barrels. Despite reaching a three-month high, middle distillate stock levels remain relatively low. The middle distillates category averaged 3.27 million barrels in 2017, but has not risen above the 3 million barrel level since last September. 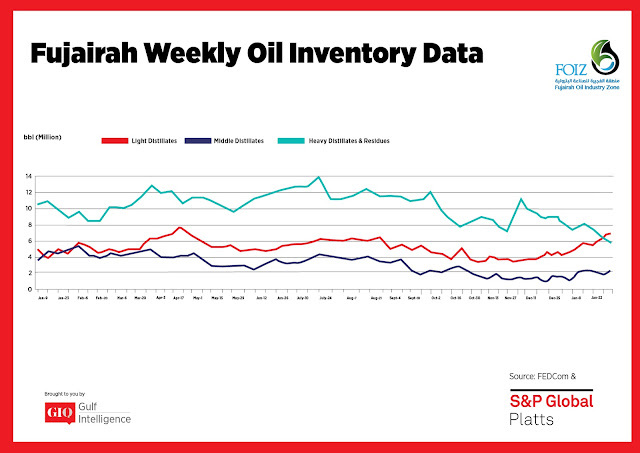 The front-month time spread for Arab Gulf Gasoil swaps was at a four-month high Tuesday, indicative of tight supply fundamentals in the East of Suez markets. Additional barrels from the Middle East are expected to be drawn eastwards given the limited arbitrage pull from the west, the report said. Stocks of heavy distillates and residues fell by 6.9% to 6.662 million barrels, reaching a record low for the second week in a row. Heavy stocks have fallen by 46% since December 4, and are currently 19% lower than a year ago. 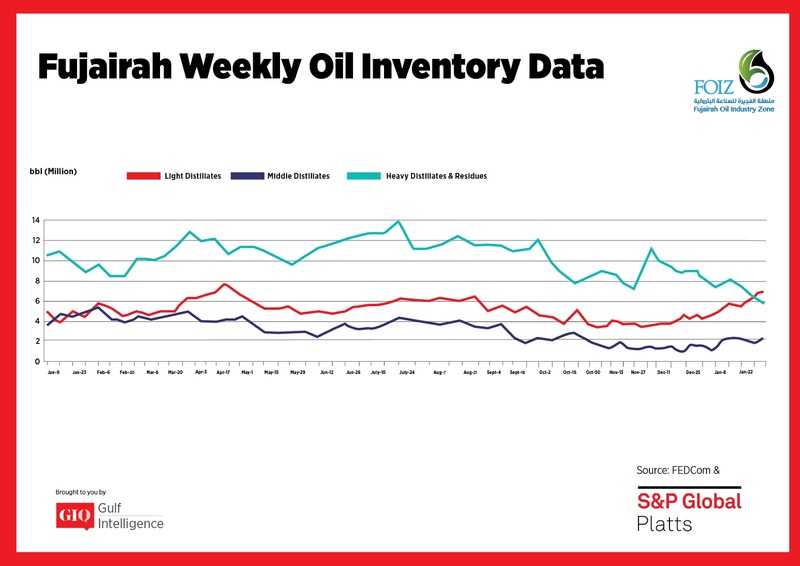 One source noted the eagerness of market players to sell off inventories given the recent surge in oil prices and market structure for fuel oil, which was in backwardation as recently as last week. Local sources also noted a number of cargoes headed to Pakistan's Port Qasim. 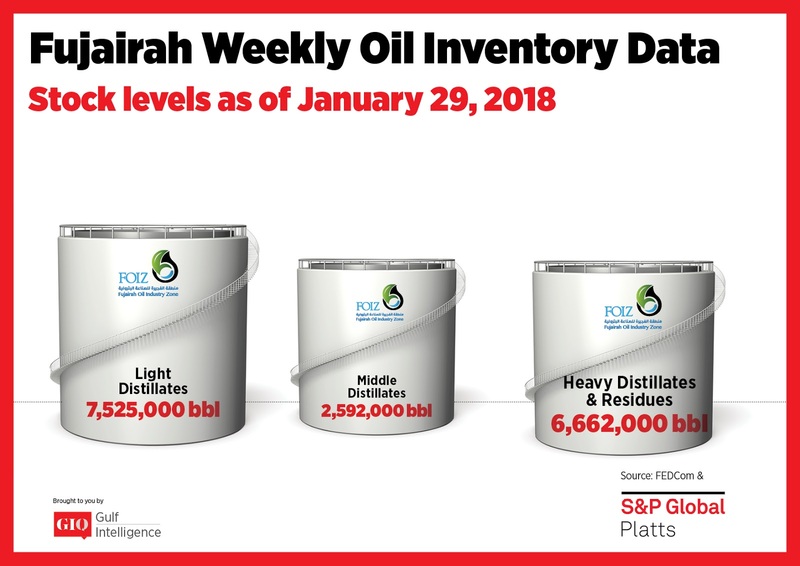 These could be the final few volumes shipped to Pakistan from Fujairah for a while, following Pakistan State Oil's decision to suspend fuel oil imports. The government is looking to restrict fuel oil burning in the power sector because of pollution concerns while demand for fuel has been reduced by increased LNG imports. PSO has typically tendered for around 500,000 mt (3.175 million barrels) each month of utility grade fuel oil loading from Fujairah.